People born as Pisceans specifically on the 11th of March are characteristically believed to be highly determined, versatile and receptive. The astrological planet that rules this particular day is our Moon and it helps create personalities that are super sensitive to their surroundings. You are intuitive, sociable and empathic if you have this birthday and will usually possess a strong sense of purpose. Anything that is extreme or different fascinates you and can cause you to investigate, question and form opinions on mainstream ideas and rules. A youthful outlook, lots of compassion and good instincts help you be an excellent communicator and a very supportive friend. Your artistic intelligent temperament is quick to grasp new concepts and loves hearing the news and views of others. Individuals with a March the tenth birthday are not really perfectionists but they can be fussy about their likes and dislikes and are sometimes unreasonably obstinate. Job choices to a person born on the eleventh of March are not ordinarily difficult as you are not particularly drawn to a certain career path. Your talents of versatility and creativity are likely to be some deciding factors in finding suitable work. The only stipulation you may have about working conditions is that the profession you will be working in reflects your high moral standards. A slightly irresponsible attitude towards your spending can often make budgeting difficult. Circumstances where you share living expenses generally make you become less reckless and more responsible with money. For a Pisces, the person born on the eleventh day of March is typically rather emotionally responsive, giving and trustful. You seem to know exactly what you want from a personal relationship and like most others sharing your zodiac sign, avidly seek a perfect Mr. or Mrs. Right. For a fish you are especially adept at boosting the egos and spirits of others and are likely to have plenty of friends. When choosing a soul mate, the friendship and intellectual affinity aspects of the partnership will be important considerations alongside physical attraction. In a partner you look for someone who will appreciate your affectionate dependability and understand your sensitivities and need for uttermost loyalty. In a long term loving union you will be sensual and uninhibited between the sheets and will more often than not put your partner first. Few health problems are experienced by those born on March 11th as keeping healthy makes a lot of sense to them. You quickly learn to strive for and preserve harmony in all life areas to keep your emotions stabilized and gain a sense of general well being. You believe this balance is just as necessary and beneficial for you personally as having a nutritious diet and taking regular exercise. If you are feeling physically fatigued or mentally drained then quiet periods of reflection could help you relax. Putting things into perspective and recharging your energies regularly revitalizes you. Your main strengths of character are usually found within your sharp intelligence, heightened perceptiveness and stylish charm. These qualities and your open minded kindness allow you to interpret situations and individuals shrewdly and make purposeful progress, helping others along the way. Discernible personality weaknesses for those born on March 11th are your tendencies to be sometimes overly possessive, stubborn and domineering. These negatives tend to show most frequently when you are upset or anxious. Another weakness that can make you inflexible and slow you down is your fussiness. Being born on the 11th of March gives you a fascination for anything beyond the boundaries of the usual. This allure can make your goals and dreams full of ambitions and wishes to do and experience more than the average aspirations. Your peace loving nature makes your instinctive and insightful hopes for the future imaginative but practical and realistic. When you set a goal for yourself you will do all you can to accomplish it to the best of your ability. You are unlikely to be deterred by lack of rewards in some accomplishments as you prefer to measure your own success from self satisfaction. As you were born on the eleventh day of the month your date of birth equates to a Root number of Two. This numerical reference to your birthday has the connected keyword 'Harmony' identifying your peaceable approach and preference for a harmonized lifestyle. In the Major Arcana Tarot deck the 11th card, Justice, is allocated to your birthday. This highlights your appreciation of and belief in honesty and fairness. The lucky gemstone selected for March the eleventh birthdays is the classy Pearl. Wearing it close is thought to increase spirit and vigor as well as entice favorable fortune. The powerful influence of the planet Neptune is assumed to be astrologically responsible for the composition of Piscean personalities. The actual day you were born on, the eleventh of March is governed by the Moon's lunar authority increasing your overall sensitivity and responsiveness. Consequently your probable personality is primarily determined by these joint planetary forces. Your fortitude, empathy and constancy are admirable traits that bestow you with a reputation for being helpful, reliable and dedicated. You are gifted with lots of sociability and effective communication skills allowing you to express yourself confidently. Your cleverness and selectiveness in thoughts and actions assist you in acquiring the things you pursue in life. If you can get your stubbornness under control it will decrease the possibilities of missing out on opportunities that you could have benefited from. 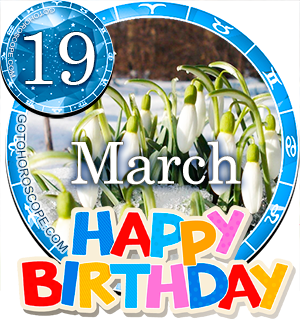 Concluding thoughts for people born on March the 11th are to discover your spiritual side and to not be too cynical about change. I fit most of the comments. the stubborness is because I have decided some things are right for me and I won't change or deviate from. I am also psychic in that I can "see" spirits. I also know things. Is that a March 11 thing?? This is pretty much spot on for me. I can be stubborn, especially when I want to make sure that someone that has hurt me, clearly understands my feelings. Cannot stand aggressive,argumentative people! Pretty much sums me up (it's fascinating how right on this is!) I am definitely not perfect, but love who I am!! Does anyone have premonition/think something & picture the scenario & then it happens (it may even be years down the road till it plays out Does anyone feel they have a connection to the other side/seen, heard, felt a presence? I do & it seems to come in spurts. I was born on March 11 any girl who wonders to marry me ? Well it's absolutely true !! Cheers up guys luv u all who born on March 11 !! This is accurate. Im just wondering why others tell that pisces women are so feminine while I am born naturally one of the boys. But the other facts are quite right. So two thumbs up for that. I feel the hardest part for me being born on the 11th is that I feel such STRONG emotions and thoughts on life but it's always been hard for me to put it into words how I feel. The weird thing about that is I believe I do have a great way of articulating my emotions but even then I don't think they truly know how I feel (not in a pretentious or angsty teen type of way) I just wish I could give them that feeling I get inside and we could share it together. So I guess I'm just wonder if it's just my personality or if it does have to do with my sign because everything up there ^^^^ was spot on. I'd love to hear people's opinions. I feel like that too. No matter how many assurances the other person gives me i know they don't feel what I have. So I understand. yaa..its true that .....i like music, painting but i dont think my careers will go doing this all?.....so 11 march born's people have no other works to do or what? I LOVE HOW IT WAS WRITTEN. I THINK THIS DESCRIBES ME BETTER THAN I CAN DESCRIBE MYSELF! TOTALLY RIGHT ON TARGET! u really described me so well even i think myself like dis only..! Why does it say that our gemstone is pearl? I know it to be of aquamarine or bloodstone. I've never heard it to be "pearl" Can anyone elaborate why? I can't find anything online that even comes close to it being pearl except for this website. The only thing i can think of is that on this website its explaining it as being specific to the 11th day of march and it being of a lucky gemstone to be worn by us born on the 11th of march. It just says pearl is your lucky gemstone, not your birthstone. This is so vague, it can apply to anyone once they form their own connotations. Yeah I was born on march 11, pretty much described me as written above. Good to know.